This kit reroutes the air flow through the intercooler so the air going to the throttle body comes from the bottom of the intercooler. Since hot air rises, the hot air will be kept in the top of the intercooler. This will therefore reduce the air temperature that goes into the engine. This pipe routing is shorter than the factory routing which will also increase throttle response. 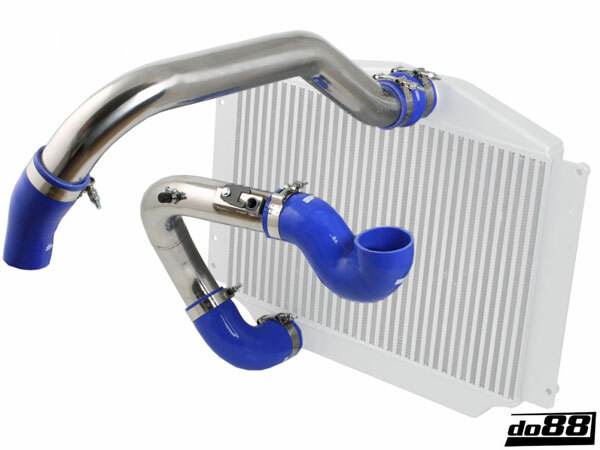 The lower intercooler pipe has a very secure attachment for the pressure and temperature sensor in a custom cast and machined flange. Original attachment of these sensors to the factory plastic pipe can often cause problems with leakage at higher boost pressure than the original. Above all this it looks far better than factory pipes! Available with a choice of black, blue or red hoses.